The new Google Nexus 10 tablet was expected to go on sale in the Google Play Store at noon EST, but it looks like it has been listed a bit early. Although, there have been some issues with the Nexus 4 running into "technical errors" while trying to purchase, so be patient. 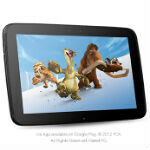 The Google Nexus 10 is the new flagship Android tablet from Google. The big news on it is the crazy 2560 x 1600 10" display, which is the highest resolution tablet on the market. The Nexus 10 is also packed with a dual-core Exynos 5 processor, a 5MP rear camera, a 1.9MP front camera, 2GB of RAM, and Android 4.2. The Nexus 10 comes in two different models: the 16GB model for $399, and the 32GB model for $499, both available now in the Google Play Store. I like this nexus soooo much, but I'm still waiting for the Surface Pro. let's try new things and don't only stick to one thing. SF pro?. oh! i think you must forget it. SF pro too heavy and too thick. And u care because of what, exactly? Dude, but it is powerful. you would have laptop and tablet in one piece. i really want this nexus 10!! hope google will offer it same price in my country!